Stuff happens. And when it happens to your smile, it can be especially upsetting. Because really, smiles make the world go round! So if you have a cavity, a chip, a toothache, or even a missing tooth, you want to have the repair and restoration done right – right? Come on over and talk to us here at Jackson Dental. Even though our favorite thing is keeping teeth in natural, healthy shape, we also love doing restorative dentistry. That’s because we work to make sure any of our dental restorations could fool Mother Nature herself! Don’t wait any longer! Call today and restore your smile back to health. Cavities can feel a little embarrassing. We know. Even dentists get them! But don’t worry. Our fillings are made out of a healthier, more beautiful choice. Unlike ugly amalgam (metal) fillings, we fill cavities with tooth-colored, mercury-free composites. They are strong and durable for long-lasting protection. Better yet, these cavity fillings match your teeth to blend in your smile and make any sign of decay disappear. No one will be the wiser! If your cavity or damage is a little bigger, but you don’t quite need a crown, we offer beautiful, custom-crafted dental inlays and onlays. An inlay is done when the damage is within the cusps, or tips, of your tooth. If the damage is more extensive, and the new structure needs to cover the entire chewing surface, we will place an onlay. Designed to match your teeth, they can revive natural strength, wear, and function. 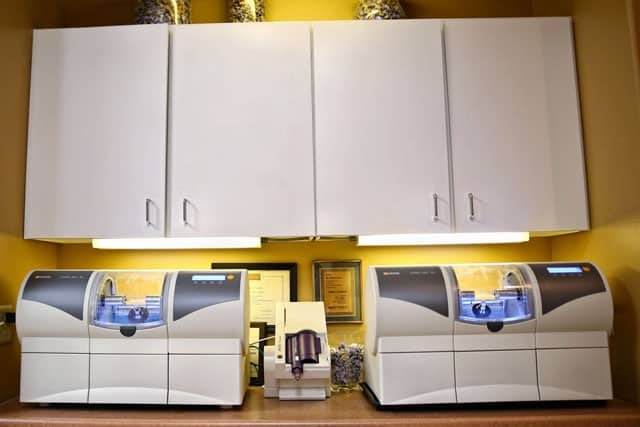 For more extensive restorations or as part of a dental bridge, we offer CEREC same-day crowns. You read that right! You can get a strong, custom-made ceramic crown made and placed in one convenient visit! If you have gaps between your teeth or are missing a tooth, talk to us about the benefits of a dental bridge made with CEREC crowns. Unlike partial dentures, our dental bridge does not come out but is permanently placed between two remaining teeth. In other words, two crowns with a false tooth are placed over the teeth on either side of the gap, filling it so naturally, no one will know it is there. It is a tooth replacement so beautiful, you may forget which teeth are real and which are created by a CEREC! Think you don’t have time to get a beautiful, custom made restoration? Ask us about CEREC same-day crowns. The name says it all! No one should have to endure the health risks, discomfort, and embarrassment of missing teeth. And neither should they have to deal with uncomfortable, denture-mill false teeth! We custom design our dentures and partials in-house for quality, fit, function, and appearance. We even offer implant-retained dentures, the most stable and comfortable dentures in the world. It’s true! Dental implants replace missing teeth so comfortably and beautifully, they might even fool Mother Nature! Click here to visit our Implant Dentistry page. A toothache strikes. The misery is unbearable. The root canal is what ends the pain. Even more importantly, a root canal saves your tooth from needing to be pulled! Root canals are so named because the procedure clears infection out of the canals in your teeth. Once all the infection and decay is removed, we seal your tooth and cap it with a beautiful CEREC crown. We get it: No one really wants to hear that they need oral surgery. But here at Jackson Dental, oral surgery just got a whole lot better with piezo ultrasound technology. This ultrasonic device allows us to perform any dental surgery with high-frequency micro-vibrations for incredible precision, less swelling, and faster recovery. Whether you need a wisdom tooth removed or a bone graft, Jackson Dental can take care of all your oral surgery needs, gently, comfortably, and efficiently. Sure. There is a little bit of dental geek in all of us here at Jackson Dental. But what really gets us excited is seeing happy patients. And that’s the real reason we have invested in so much advanced technology. Our technology makes our care better – more accurate, higher quality, and much more comfortable. Oh and wait… did we mention the convenience? We use CEREC technology to create incredibly strong and beautiful dental crowns in one visit! Our Galileos cone beam lets us get super high-quality 3D images with minimal radiation. And our Cadent digital impressions make it possible for us to get pin-sharp records with no gooey, gaggy impression material.